Dora is back, and Vio's styling choices have not improved. - My purple and gold Nissan was hit while parked up overnight, the damage was similar to Dora's but I'd had enough fun with that one and decided to scrap it and upgrade. - Bought a Mercedes c200, learned it had a blown head gasket, spent £1k fixing it, lasted a year or so but then the engine died again (no compression in 3rd cylinder) so I sold that on as spares. - Bought a mk4 Golf with a blown head gasket (what is it with me and buying cars with blown head gaskets), engine seized up after like a month and sold it for £50. - Figured it was about time I get that old Polo of mine back on the road. I figured the bodywork was in reasonable enough condition that I could throw it in for an MoT, but it wouldn't start. Drained the fuel tank and tried some fuel cleaner, changed the rotor arm, dizzy cap, ignition coil, spark plugs, but it still wouldn't spark. So I handed it over to the garage who ended up replacing the whole distributor, and did a little bit of welding on the offside sill - which is the bulk of the remaining rust taken care of. Then they put it in for MoT, and it passed with no advisories. Nice! First thing to do (after hitting up maccies) was a little tidying - I got rid of the old seat covers and tacky ebay floor lights+gear knob, and tried scrubbing out all the dirt and dust from the seats with a vaccuum which partially worked, and I'll think about steam cleaning them another day. Also reinstalled my old head unit, but rather than hook back up my 6x9s I decided to treat myself and finally make use of those door pockets with speaker holes I bought 3 years ago but never got speakers for, for whatever reason. They do have blue lights, but I haven't wired those in as yet, as I'll run a new loom around the car to replace all of the old lights I had with some new stuff, and I'll connect them up to that in the near future. They do sound good, though I was planning to use my 1050w sub with them... but I can't find the damn thing. I assume I forgot to take it out of one of the various cars I've had before getting rid of it. Ah well, at least I know where my next paycheck is going. And I wired up a t10 to replace that crappy little yellow bulb for the heater controls (as well as replacing the cigarette lighter with a blue one). I'll probably add a second one later as well, but it looks pretty good as it is. Finally the last thing to do was try and clean off 3 years of crap from the outside. Gave her a fairly unceremonial wash, and tried to polish some of the obvious stuff out. I got as far as the bonnet and front quarter panel before running out of elbow grease. The crap on the back end doesn't seem to want to polish anyway, probably due to my previous rattle canning efforts, and some of the paint is peeling off anyway - so one of two things is on my to-do list: a respray (which I can't afford for sure)... or a wrap. Good work on that wing. 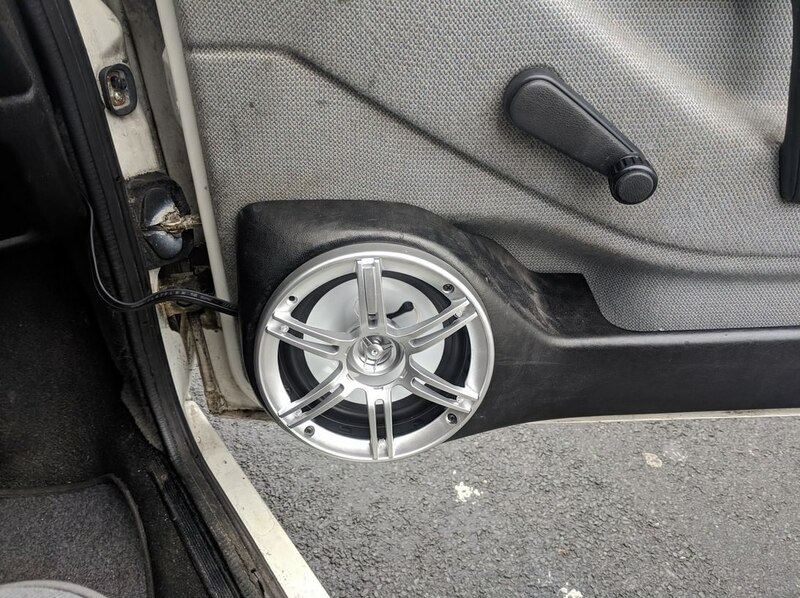 I thought for a tiny moment that the speakers were alloy wheels. What music are you rolling to? Last week the good people of Leigh decided to stage a fight without my consent between a pint glass and my back window. Rather than deal with insurance and/or pay someone to replace the glass, I decided to just replace the entire bootlid. I managed to pick up a white one which saves me having to paint it at least, and fitted it myself (almost breaking it and myself several times in the process trying to fit a bootlid on my own, but hey if I had asked someone for help it wouldn't be DIY - right?). I also took the opportunity to add some ice blue number plate lights. Ignore the wonky reg and chipping paint - I'll see to those eventually. At least the car is pretty much all one colour again ...aside from one little bit. I've decided to road test some chrome vinyl again. I tried it on Neko some years ago and it didn't work out all that well, but this time I've actually done some proper prep and sort-of almost nearly applied it properly too. We'll see how well this holds up, and whether I spend an unreasonable amount of money on cheap ebay vinyl within the near future. Also bought some more T10 holders and replaced the one I used for the heater controls (which was originally from the sidelight in my old 6n's headlight) with two smaller ones. Much more even spread now, and it's super bright, even in daylight! Last electrical work today was replacing the head unit (the one I've had for 5ish years where all the lights are red compared to all the blue I have in the rest of the car which really messes up the feng shui of the whole thing). Bought the cheapest one with blue lights I could find off ebay. Despite wiring it up correctly as per the instructions, the speakers seem to be controlled as if I had a front left and rear left only, but as I only have two it's not really a big deal. And the LCD display seems a bit derpy, but I suppose you get what you pay for. It fits in well though. Don't be bloody lazy and sort out that wiring! Now that's a good-looking centre console. Looks like your car now. Any tips for DIY change a boot lid on your own? Whilst cleaning out the garage I found an aftermarket wheel that I bought several years ago, but never fitted for some reason. Quick update on how things are going. As I understand it, the alternator belt snapped, somehow got caught up in the timing belt, and now I have no compression in 2 cylinders. Now I know what the cam belt cover is for. Might just be two bent valves... 120,000 miles is nothing, if car had regular oil and filter changes and was driven gently when cold.